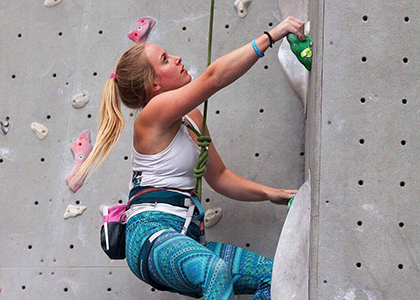 Georgia Pilkington started climbing aged 7 at her local climbing centre in North Devon. 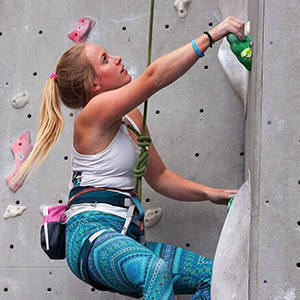 She started wearing hearing aids aged 9, but this has not held her back – at 16, she went on to win all three rounds of the BMC Para Climbing Series for the Hearing Impaired category. However, in 2015, Georgia was formally diagnosed with Autism, she struggles hugely with social anxiety and other sensory issues and together with her deafness, has struggled with bullying and exclusion from her peers at school. “I love it so much! My favourite type of climbing is definitely climbing outdoors whether it is bouldering, sport climbing and even traditional climbing! However, I do love training indoors in climbing gyms, as its still lots of fun and I can work on my technique and get stronger too! I climb 5 times a week in a climbing gym (Quay Climbing Centre and Rock and Rapid Adventures) or at home on my own little wall and Beastmaker (specific climbing training), and I go to a proper gym twice a week to improve my strength and cardio. I also go surfing for fun, along the North Devon coast and Cornwall plus I have recently started playing hockey for a local ladies team, the Taw Valley Ladies! I have profound hearing loss in my right ear and I am moderately deaf in my left, which means I have to wear hearing aids, but I don’t sign as I’ve been brought up with a hearing family and in mainstream schooling. I lip read a lot of the time as well, which can be a struggle when communicating with my belayer and my coach, being hard of hearing doesn’t effect my climbing, only when I’m having an iffy balance day. I was diagnosed with ASD (Autistic Spectrum Disorder) in the summer of 2015. I’d say being autistic, has impacted my life the most, in climbing and in my personal life. I used to compete a lot when I was younger in the British Youth Climbing Series and lots of local competitions and also the Blocfest series, but due to my anxiety increasing as I have got older, competing has become more and more difficult. I was unable to climb to the best of my ability and it did start to slowly destroy my love of climbing – I was forgetting why I climbed in the first place. Due to the anxiety attacks, and once due to the stress of competing, I passed out, so I find I am unable to compete in mainstream competitions anymore. Fortunately I have been able to compete in the Para Climbing series for the last 3 years. It is a very relaxed competition series which ensures every disability has a chance of climbing at their best. I have had a very successful 3 years with this series, becoming British Para Climbing Champion 2014-2016 for the hearing impaired. It is unfortunate that my category is not recognised by the IFSC (International Federation of Sports Climbing) and so the GB Paraclimbing Team is unable accommodate either Autism or Deaf categories. It would have been great to compete internationally. I think is would be incredible if climbing got into the Paralympics! If there were autistic and deaf categories, I would definitely fight with everything I have to be able to compete, It would be a dream to be able to compete in Para Climbing on a world stage. 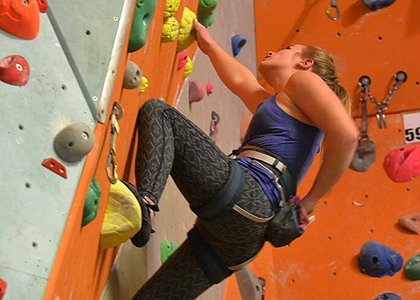 Since, the announcement of Climbing being part of the 2020 Olympics, more and more people in the UK are joining their local climbing gyms, especially bouldering ones. Also, lots more centres are being built enabling more and more people access to the sport. I’m so happy that climbing is becoming more mainstream as it is simply the best way to meet people and be sociable as everyone is always very friendly and willingly give you advice on different problems and routes. Climbing is so important to me, when I’m on a route or boulder problem I become disconnected with the world and I become one with the rock (or plastic route / boulder if I’m indoors). It brings me so much joy and happiness it’s unreal, it is my calm, and my mental salve. Climbing has given me many opportunities that I never thought possible. My coach Mikey Cleverdon has played a big part in my climbing career so far, and is one of my biggest inspirations, and I would not have achieved my climbing standard now without him. The best place climbing has taken me is bouldering in Fontainebleau in France which has some of the best bouldering in the world. Also, climbing took me to the Swiss Alps, in Zermatt where I climbed the Matterhorn in the summer of 2016 with a group of guys, including the enthusiastic alpinist and speed flyer, Willis Morris. I have a number of other climbing trips planned for this year which I’m very excited for! My main ambitions in climbing, are to get stronger and climb really hard outdoors in Sport Climbing and Bouldering, I’m also very keen to climb another mountain, Mont Blanc Perhaps? 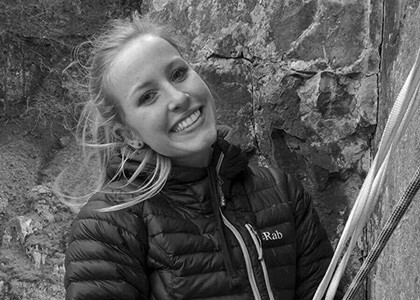 I want to get more women involved with climbing to! Women Climb is an organisation that does just this, and I love getting involved with their work as what they do is truly inspiring. I will continue to campaign for greater inclusiveness of disabilities in climbing, especially Hidden Disabilities, because there are climbers out there, like myself, that truly struggle with their daily lives but still climb for the shear enjoyment, which I think is awesome. Unfortunately, the world is pre-disposed to only recognise visible disabilities. I 100% recommend climbing to everyone including people who have a disability. Climbing is so inclusive now, and it has helped me recover and heal after my diagnosis’s. Everyone is so encouraging and see you for you, not for your difference.